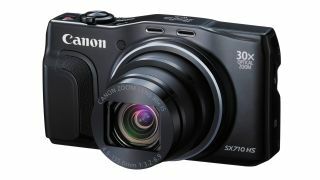 This Wi-Fi-enabled compact boasts a 30x optical zoom, which makes it ideal for travel. Here are the best prices! Need a whopper of a lens but not a whopper of a camera? This red- or black-bodied superzoom compact manages to squeeze a 30x optical zoom into its tiny shell. Furthermore, the additions of a pop-up flash and built-in Wi-Fi make it an even more logical choice for holidays or travelling, particularly if you don't want to kart around a DSLR or mirrorless camera. We also conveniently get Full HD video capture to 60p, although there's no touchscreen provided here, nor, perhaps less surprisingly, the option of Raw shooting, which will limit its appeal to the point-and-shoot brigade. Still, the PowerShot SX710 HS very much has convenience as its focus, with its useful 35mm-equivalent focal reach of 25-750mm covering most situations. At the camera’s back is a small mode dial that allows users to switch between different exposure modes on the fly, while a quick menu button is helpfully located at the centre of the rotating dial. Canon’s Creative Shot mode also makes an appearance, and this provides access to digital filters for added visual pep. In good light the PowerShot SX710 HS produces images with vibrant colours, and delivers a good overall impression of detail at normal printing and web sizes. Shots taken at the extremity of the zoom provide a good level of detail, making the camera suitable for the wide-ranging selection of imagery we typically all take on our travels. Inevitably, if moving higher up the camera’s sensitivity settings to the likes of ISO 800 or 1600, there's more visible image smoothing and loss of detail to combat the effects of image noise – an obvious drawback of having a small-ish sensor offering a large-ish resolution. Although the camera isn’t exactly crammed with (possibly distracting) features, there's not a lot to dislike about it either.